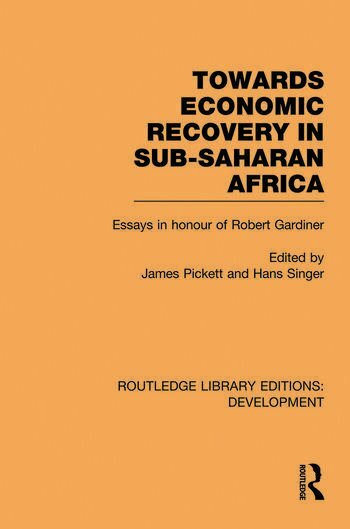 First published in 1990, this volume considers the question: is there any hope for economic recovery in Africa? Written by a team of leading development economists, the book takes a close look at the economic decline of Sub-Saharan Africa and provides a set of guidelines for promoting economic recovery. Stressing the need for greater co-operation between African states, the contributors outline the economic and social policies required to put this crisis-torn region back on the road to sustained development. 1. Towards Economic Recovery in Sub-Saharan Africa 2. Ghana’s Experience with Structural Adjustment: Some Lessons 3. Ghana’s Economic Reforms, 1983-7: Origins, Achievements and Limitations 4. The Volta River Project: for Whom the Smelter Tolled 5. Public-Sector Pay: the Case of Sudan 6. Economic Integration/Co-ordination in Africa: the Dream Lives, but how can it be Lived? 7. Economic Integration in Africa: A New Phase 8. Intra-African Trade 9. The Optimum Amount of Development Assistance 10. The Role of Food Aid 11. Social Development in Africa: Perspective, Reality and Promise 12. The Low-Income Economies of Sub-Saharan Africa: problems and Prospects.